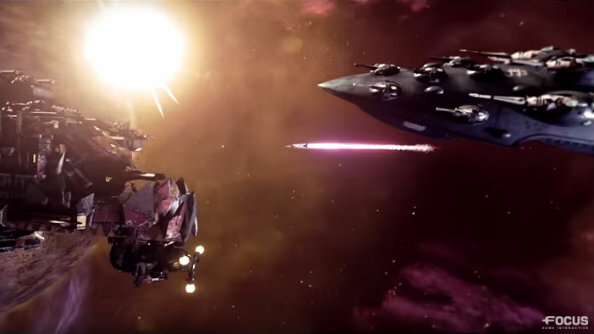 A new trailer has released for Battlefleet Gothic: Armada, showcasing the speed and grace of the Eldar race. Space ships are cool, right? There’s more of them in our picks of PC’s best space games. Last week we were shown the brutality and might of the Ork fleet, along with the announcement of Battlefleet Gothic: Armada’s release date, but now it’s time for the Eldars to get their streamlined ships in the spotlight. Eldar ships are fast and highly maneuverable, thanks to them packing some of the finest tech in the universe. They use guerrilla hit-and-run assaults, flying by and delivering massive damage, only to escape and arc back around for another bombardment. With the exception of their battleships, these high-tech craft aren’t fitted with shields, instead relying on advanced Holo-fields, which makes them extremely hard to track. Destroying Eldar ships’ engines is the best way to keep them at close-range, taking away their best asset and exposing that glass jaw so it’s ready for a swift and accurate uppercut. Battlefleet Gothic: Armada will release April 21.